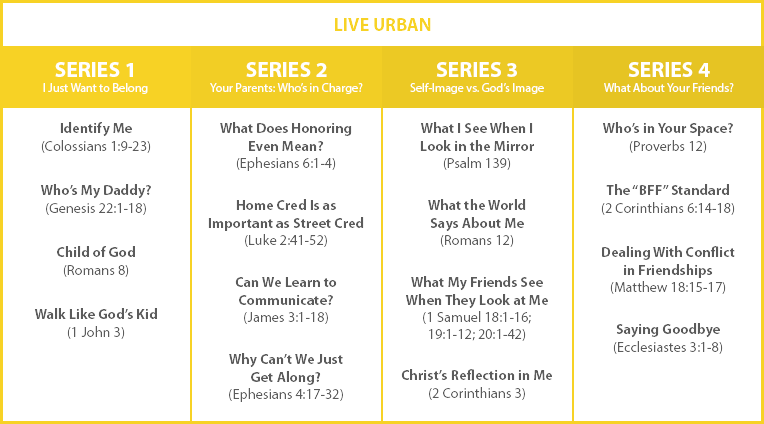 LIVE Urban will help teenagers grow healthy spiritual lives rooted in a Christ-centered understanding of who they are. These 16 lessons move beyond urban stereotypes and creatively engage your students in dynamic conversations. This item is available as a digital resource only. A physical resource will not be shipped for this item. **Digital resources are not available for return. ** You'll receive login credentials to the LIVE engine within 1 business day of purchase. Urban youth ministry isn’t just about reaching teenagers in the inner city. It’s less about a street address and more about a generation stuck in survival mode. The 16 lessons in LIVE™ Urban move beyond urban stereotypes to creatively engage students in dynamic conversations built around four themes: parents, self-image, friendships, and the need to belong. LIVE Urban will help teenagers grow healthy spiritual lives rooted in a Christ-centered understanding of who they are. They’ll discover biblical wisdom on relationships and explore the rewards of investing in their reputation at home, not just with their friends. Save Time: Meaningful, relevant material is always right at your fingertips. Gain Credibility: Inform and empower parents through the weekly Parent Email templates with details about each lesson and practical questions they can ask their kids. Train, prepare, and communicate with your leaders through the online management system. Maximize impact: Use your passion as a youth worker to help urban teenagers move to a place of thriving in Christ. Parent Emails: Because of the unique challenges and opportunities of urban ministry, we’ve also developed post-lesson tools for communicating with parents. Online Management System: Every new account includes one year of access to the online tool that allows you to manage and edit lessons, communicate with your leaders, create calendars, and more ($99 value). Your students may know a lot about Jesus, but do they truly know him? When some people think of urban youth ministry, they picture dangerous neighborhoods, run-down schools, and police sirens in the middle of the night. While that image does describe daily life for some teenagers, we recognize that urban youth ministry isn’t just about reaching out to the inner city. It’s less about a street address and more about a generation stuck in survival mode—students struggling with their identity, with families that are hurting and broken, existing rather than living. Your passion as a youth worker is to see those teenagers move to a place of thriving in Christ. That’s why we created LIVE Urban. These 16 lessons move beyond urban stereotypes and creatively engage your students in dynamic conversations built around four fundamental themes: parents, self-image, friendships, and the need to belong. LIVE Urban will help teenagers grow healthy spiritual lives rooted in a Christ-centered understanding of who they are. They’ll discover biblical wisdom on relationships, including knowing when to end friendships that are unhealthy, destructive, or dangerous. And they’ll explore the rewards of investing in their reputation at home, not just their reputation with their friends. BONUS: Because of the unique challenges and opportunities of urban ministry, we also have developed additional tools for communicating with parents after each lesson. Connecting with parents allows them to know you are partnering with them in the lives of their son or daughter. A changed parent = a changed family = a changed neighborhood = a changed community. This item is available as a digital resource only. A physical resource will not be shipped for this item. Please note that digital products are non-returnable: all sales for these items are final. These 16 lessons move beyond urban stereotypes and creatively engage your students in dynamic conversations built around four fundamental themes: parents, self-image, friendships, and the need to belong. Every new account includes a year access to the online tool that delivers curriculum and manage your leaders ($99 value). With our online management system planning your small groups has never been easier. You can follow our road map, and choose which lessons you want to teach and when you want to teach them. But you aren’t even limited to one schedule, you can have different calendars in case you want to have different groups going through different lessons. Once you set your schedule, you can assign your small group leaders so they know exactly what they are teaching simply by logging in to the Live Curriculum using their own account created by you. Not only will they see what they are teaching, but you can also send them messages and share files you want them to have for small group. And since it’s online it’s always available so you and your leaders can prepare when it’s convenient for them. Is there anything easier than that? Sign-up today for a full test drive of LIVE! You’ll have full access to the LIVE online management system and access to over 30 free lessons covering each of our 14 LIVE lines! You will be redirected from Group.com to the LIVE product web site to complete your LIVE purchase. If you've added items to your cart that are not LIVE products, they will remain in your cart on Group.com.